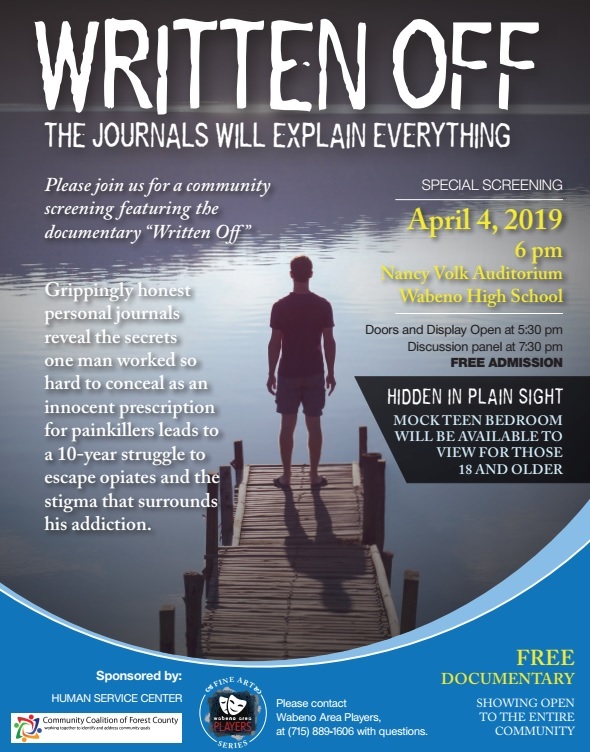 Please join the Wabeno Area Players on Thursday, April 4th, 2019 for a community screening of the documentary “Written Off”. The event will be held at the Nancy Volk Auditorium in the Wabeno Area High School. The Forest County Healthy Department will also offer a Mock Teen Bedroom display beginning at 5:30 p.m. for those 18 and older. A discussion panel will be available after the screening. The documentary is free and open to the entire community. The film tells a gripping tale and challenges stigma. In 2016 more Americans died from overdoses than in the entire Vietnam War conflict. And yet those new casualties are rarely considered victims of disease. The film chronicles the life of Matthew Edwards, a Crandon High School graduate, whose addiction to opioids began at age 15, after being prescribed pain medicine for minor surgery. His grippingly honest writing reveals the secrets he tried so hard to conceal throughout a decade long struggle to escape addiction. 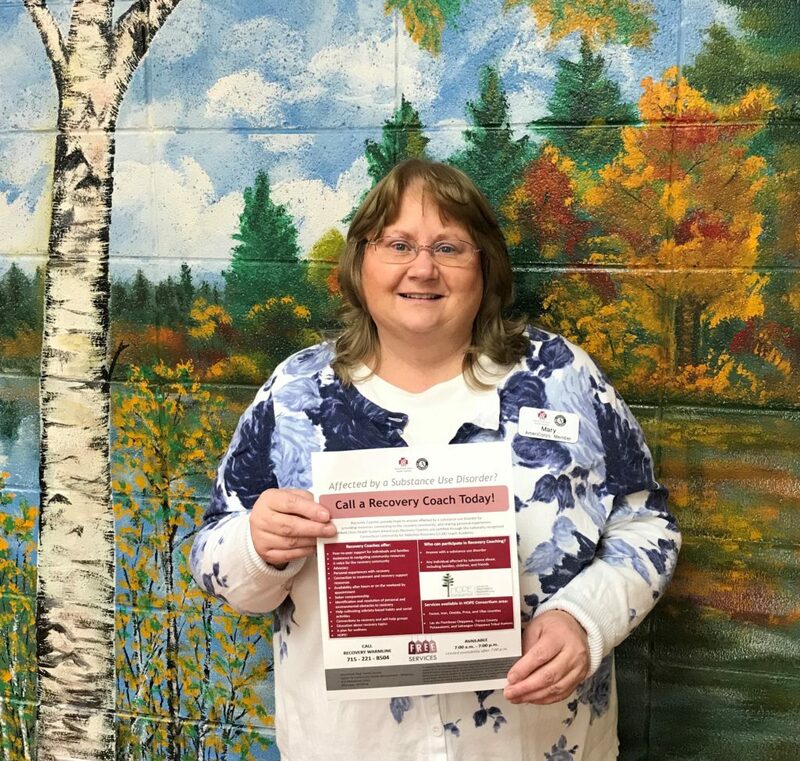 Matthew’s mother, Jane Funk, currently a teacher at Crandon High School, published the book What I Couldn’t Tell you: one Man’s Struggle with Opioid Addiction in June of 2017 and worked with filmmakers Molly Hermann and Rob Lyall on the “Written Off” documentary. 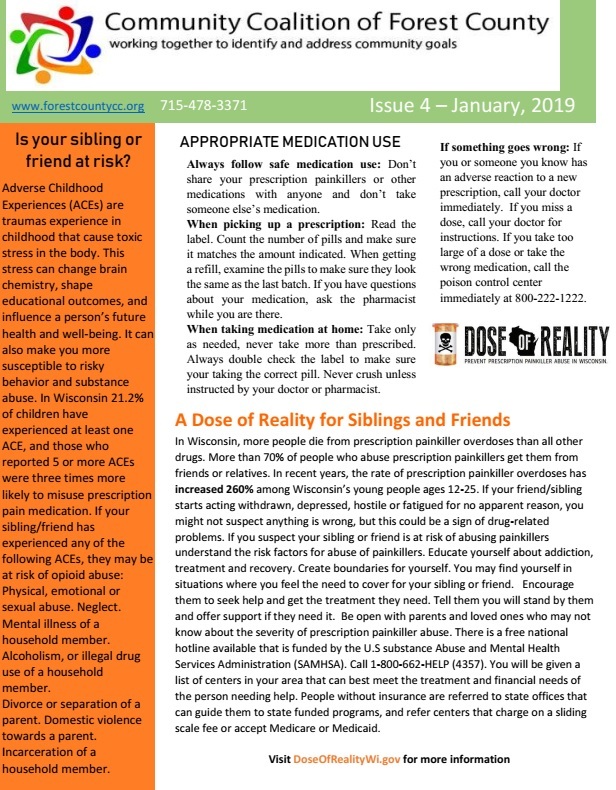 The Community Coalition of Forest County’s January 2019 newsletter is now available on our newsletter page. Please feel free to share the newsletter with family, friends and colleagues. 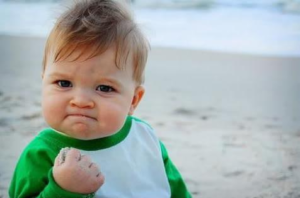 Registration for the Youth Mental Health First Aid class that is scheduled for Tuesday, February 12th is now closed. We are excited to announce that all 30 seats have been accounted for with representatives from four school districts, two tribes and a handful of concerned citizens. Great job Forest County! Prescription Painkillers. After the pain, they’re just killers. You may be surprised to learn that prescription opioid (or narcotic) abuse is a big problem in the State of Wisconsin. You are not alone. That’s why the Wisconsin Department of Justice, in conjunction with the Wisconsin Department of Health Services and partners across the State, is sharing a DOSE OF REALITY and working to prevent prescription painkiller abuse in Wisconsin. When prescribed and used properly, prescription opioid painkillers can offer relief. However, anyone is at risk of becoming addicted, especially our young people ages 12-25. 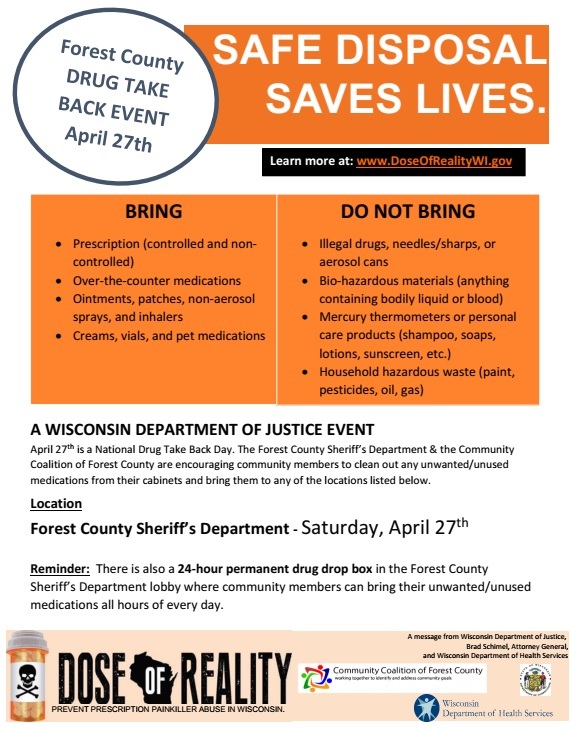 Join thousands of other Wisconsinites taking positive action during DOSE OF REALITY WEEK, April 22-29, 2018. Author Michelle G.Posted on April 24, 2018 April 27, 2018 Categories UncategorizedLeave a comment on Prescription Painkillers. After the pain, they’re just killers. 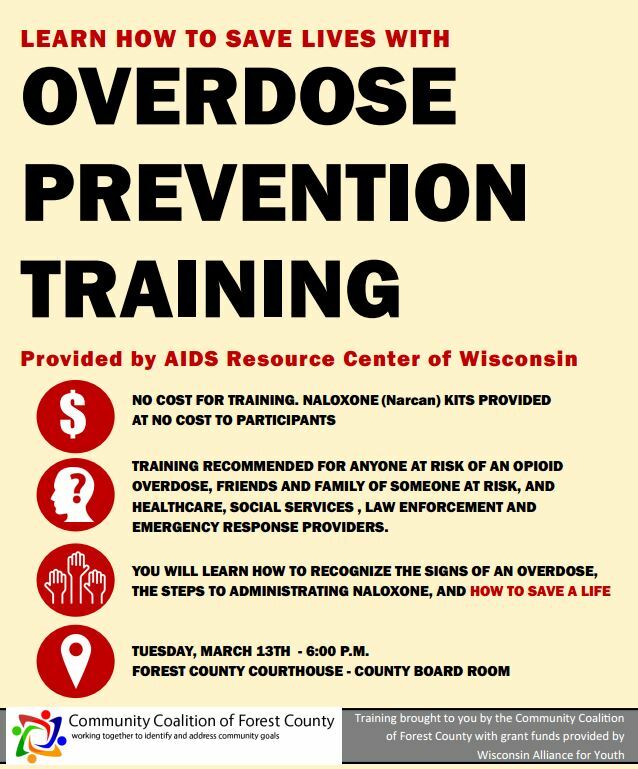 To respond to the increase in opioid overdoses locally and statewide, the Community Coalition of Forest County is partnering with the AIDS Resource Center of Wisconsin to provide free overdose prevention (Narcan) training to Forest County residents. 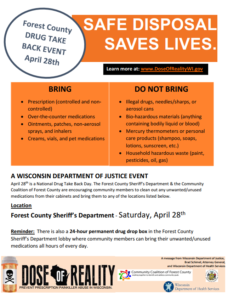 The training will include information on local substance abuse resources, the importance of alerting emergency responders (calling 911), and hands-on experience with administering Narcan. Participants will receive a free Narcan (overdose reversal drug) kit that can be used to respond to an overdose. The training is recommended for anyone at risk of an opioid overdose, friends and family of someone at risk, healthcare, social services, law enforcement and emergency response providers. Concerned community members are also encouraged to attend the free training. 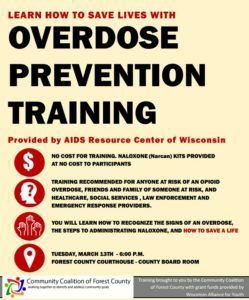 The training, led by the staff of the AIDS Resource Center of Wisconsin, will be held on Tuesday, March 13th at 6:00 p.m. in the Forest County Courthouse Board room. Grant funding for the training is provided by the Wisconsin Alliance for Youth. 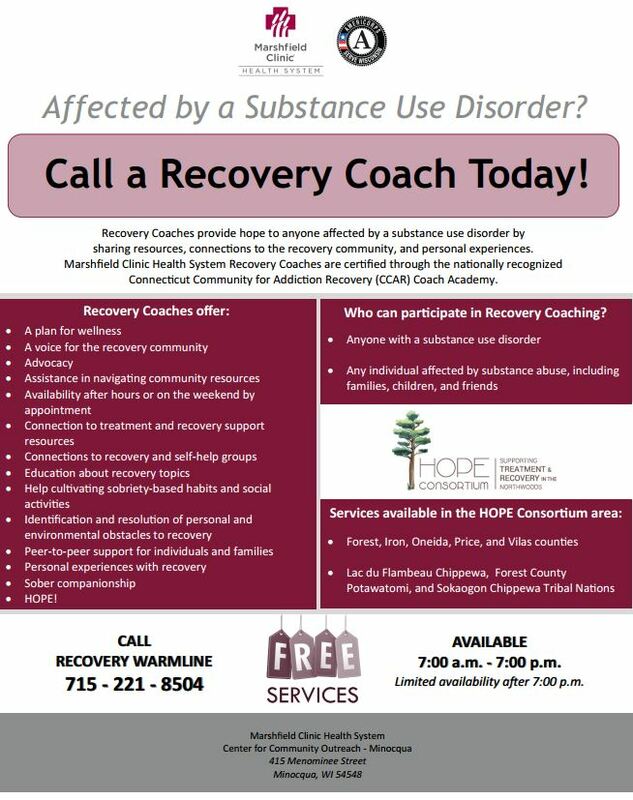 For more information, or questions, please contact Jacee Anderson at the Forest County Health Department at 715-478-3371 or Michelle Gobert at the Forest County UW-Extension office at 715-478-7797. The Community Coalition of Forest County is glad you are here. We are in the process of updating our site with new information and added content. Please be patient with us. The Community Coalition of Forest County (CCFC) is a 501 (3) (c) Non-Profit Organization that was formed in 2008 for the purpose of informing and engaging all age groups and cultures in our diverse county in a collaborative effort to measurably improve the health and well-being of our residents with a focus on substance abuse and prevention.